It’s a case study in how a few American businesses with long-standing household names, and their D.C. lobbyists, can set in motion changes to a global market and cause some of the planet’s biggest financial institutions to alter their operations. If you can make a complex disagreement over commodity pricing about beer, you probably should. That’s what beer lobbyists proved this year with a successful campaign that translated a fight about obscure commodities markets into something everyone can understand: the price of a can of beer. In the spring, the Beer Institute, a trade group that represents big brewers including Anheuser-Busch and MillerCoors, ramped up their lobbying in Washington, D.C., to draw attention to the vagaries of the global aluminum market, claiming that big Wall Street firms were taking advantage of obscure metals regulations to drive up the prices. 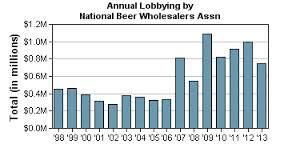 “Wall Street megabanks should not be able to levy hidden taxes on Main Street beer drinkers,” as Sen. Sherrod Brown, D-Ohio, put it in August. In the months since, lawmakers have called for banks to divest their commodities holdings, regulators and law-enforcement agencies have opened investigations, and the Federal Reserve floated the idea of making it more expensive for banks to own physical commodities. Now, the London exchange that runs the aluminum market is changing its policies. It’s a case study in how a few American businesses with long-standing household names, and their lobbyists, can set in motion changes to a global market and cause some of the planet’s biggest financial institutions to alter their operations. So, the aluminum market is a complicated place involving an exchange in London, warehouses all over the world, and buyers with disparate interests — some are investors, others are using the metal to make stuff.